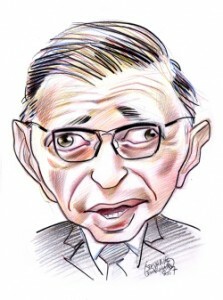 In 1946 Existentialist philosopher Jean-Paul Sartre gave a lecture entitled “Existentialism is a Humanism,” in which he presented an argument that neither Christian ethics nor Kantian deontology are very helpful with actual, real-life ethical dilemmas. He sketched one such dilemma for his audience, about a young man who has to decide whether to join the anti-Nazi resistance or stay at home with his frail mother, concluding that the answer to ethical questions always depends on the details of every particular case, and that therefore we need to go the Existentialist route and “trust in our instincts.” The question I wish to explore here is that of what a Stoic would do in the scenario imagined by Sartre. Now, I actually think that Stoicism is a better model for Secular Humanists (as well as for many religious people, actually) than Existentialism, a topic I explore in this video, and that I have recently discussed with my friend Skye Cleary (who defended the Existentialist position, video to be published soon). Back to Stoicism. To begin with, since Stoicism is a type of virtue ethics, it too does not provide universal answers, but needs to weigh the details of individual situations. While many consider this a weakness of virtue ethics when compared to “view from nowhere” systems such as Kantian deontology and Mill-style utilitarianism, I think it is a strength and agree with Sartre that ethics is often, if not nearly always, situational. Now, it seems to me that in the scenario posed by Sartre the greater virtue lies in defending liberty from tyranny, even at the cost of causing distress to one’s own mother. I cannot imagine a Cato, for instance, setting aside plans of taking on Julius Caesar on the ground that Cato’s mother will inevitably suffer as a result of the possibility of her son’s death. Or consider whether Marcus Aurelius, the philosopher-emperor, could have possibly decided not to go on the Roman frontier to fight the Marcomanni on account of the very real anguish that his decision would cause to his family and friends. This example also shows, I think, where Stoicism most sharply differs from one of its main ancient rivals, Epicureanism. Epicurus very clearly advised his followers to stay away from social and political action and to focus instead on family and friendships, because doing the former will decrease their happiness and especially augment their pain. The important thing to realize is that a Stoic would join the Resistance not because of some sort of utilitarian calculus of costs and benefits — since there Sartre is right that any such calculus is next to impossible. Nor is the Kantian “ends not just means” imperative going to be useful here, for precisely the reasons Sartre outlines. The Stoic would, painfully, leave his mother and fight for a broader cause because it is the virtuous thing to do, regardless of outcome. It is virtuous because it exercises the virtue of justice, which guides Epictetus’ discipline of action, and because the Stoics were cosmopolitan, caring for all of humankind. It is to be done regardless of outcome because the outcome is not up to us, only our judgments and actions are, the crucial distinction at the root of Epictetus’ famous dichotomy of control. This entry was posted in Other philosophies, What Would a Stoic Do? on April 4, 2017 by Massimo. The convenience of that particular example for your analysis is also its trouble: everyone agrees that Nazis are evil, so that war was more clear cut than many other conflicts, where the liberty v. tyranny element is not so clear cut and choosing virtue is complicated somewhat. Not sure how the specific example (which I didn’t choose, it was Sartre’s) makes it particularly easy for me. Sartre himself didn’t think that was an easy decision to make. In cases were the tyranny vs liberty contrast is less clear one would need even more practical wisdom to tell the difference, but the basic idea stands. If compassion cannot be derived from the Stoic virtues, that strikes me as a major weakness of Stoicism. If it can, then we have here a conflict between two different ways of manifesting virtue. The Stoic doctrine of oikeiosis is their version of compassion. The Stoics were clear in saying that we should do our best to understand other people’s predicament and not be quick to judge. I’m not sure what conflict you refer to. There are four virtues in Stoicism, which are often considered four facets of the same underlying one, wisdom. The conflict is the one facing the young man in the example. His concern for his mother is oikeiosis, the more so perhaps if we remember that oikos means home (yes, I know that such linguistic arguments are weak, but the are still suggestive). Yet he will be exercising other aspects of virtue if he goes off to fight. And he must chose which to practice. I cannot think of any argument that might help him. I gave an argument in the post. Oikeiosis means home, but in the cosmopolitan sense, for the Stoics. The priority is clearly for social over family duty, as far as the Stoics are concerned. As I said, this is one of the things that distinguishes them from the Epicureans, for instance. The caveat you expose is quite interesting. If the motivation leading to the young’s man will to join the resistance is vengeance, then the Stoic thing to do would be to exert the virtue of temperance and stay taking care of his mother? Can we then say that the Stoic way to take decisions is first to do an introspection about her motivations, and then decide according to the virtues and the dichotomy of control? But in the specific scenario brought up by Sartre, it seems to me that a mother’s distress is just not enough of a reason (say, as opposed to a clear and distinct danger to her life) for her son to forgo his duties to society. True, he doesn’t know how effective he will be, but that’s true in general, and that sort of consideration could become too easy an excuse not to get involved. As for Cato and Marcus, those are role models, and even though their specific situation doesn’t apply to most of us, the general principle, I think, does. Indeed, the common excuse for morally lazy people in Republican Rome was “I’m not a Cato,” meaning that not everyone has Cato’s moral rectitude. But is that a reason not to try? I don’t think a Stoic would look at his motivations first, but his motivations would enter into his decision. It’s sort of a combination between utilitarianism (where the motivations don’t count) and deontology (where their are first and foremost). Massimo, I’m interested in the “social duties override duties to family and friends” — what if the war is an unjust war (ie. Vietnam)? In that case would the duty of a Stoic be to go underground and resist the war effort? Or what if, in reverse, the father had been a resistance fighter and the son wanted to support the State (in this case Nazi party) because he believed it was his social duty to “fight for a broader cause”? My point is this: what seems right (the virtuous, wise choice) might be unclear. It’s often not possible to know the real truth about why people fight wars: for land, money, trade routes, natural resources, etc. Wars are often morally complex situations, with less than clear political and social motives. In that case, if the son doubted what the just social action in supporting/resisting a war effort might be, couldn’t he be making the clearest virtuous choice by staying home to care for family? As I stated before, I’m not arguing that social duties always override duties to friends and family. Virtue ethics is situational. In the case of fighting the Nazi vs the distress to the mother I think the social side outweighs the personal. As I mentioned in a previous comment, had the mother been in direct danger to her life, probably not. Right, the Vietnam War was not a just war (and pretty clearly so), and there are in fact precedents of Stoics taking up arms against their country (Cato). The Stoic doesn’t have ready made solutions to these issues, and a good thing it is. As Becker says, decisions need to be made “all things considered,” and the guide to those decisions is our prudence, or practical wisdom. OK, I see now what you wanted to say. It is just that I thought that the point of what Sartre was saying in that excerpt was that there will always be some situations where two or more of our roles ask for different actions to be made and neither clearly outweighs the other (e.g. what if the boy knew the mother would most probably die if he left). Considering the uncertainty of the outcomes of our actions, in these situations “nothing remains but to trust in our instincts.” Surely a Stoic will face these hard choices too. But a Stoic will probably have a better way of accepting the consequences of her choice, whether it turns up to be good or bad. I’d stike with ma. I wouldn’t over think it. I think there is more than that to it. Sartre basically says we should go with our gut feelings. Stoicism isn’t about gut feelings, of course, but about reason, exercising our “ruling faculty.” And it does provide a framework for establishing priorities. So it offers tools to the thinking person for reasoning her way through this sort of difficult situations to arrive at the best decision, all things considered. Along the same lines as Paul, I don’t think the choice of the social over the family one is as obvious as you make it seem. For one, it seems like a false dichotomy. My understanding Oikeoisis is that is it the collapsing of distinctions between you and successively larger concentric circle of social relations (family, neighbors, fellow citizens, etc). So if this rough definition is correct, family members are on equal standing with anyone else in terms of my necessity to do justice. and further, i don’t see justice as a utilitarian virtue in the sense that the more people I could do justice to, the better. In this sense, the young man could choose to do justice by his mother (who is obviously psychologically unstable and in need of family support, her son being the only member left) or by the country. It would be the right thing to do to take care of your mother that has taken care of you your whole life and lost everything, and it would also be right to fight against a cause you know to be wrong. That’s a reasonable interpretation, but I don’t think it fits quite as well with overall Stoic philosophy. First, again, I never said that the social always overrides family duties. Second, right, oikeiosis means “contracting” the circles of concern, meaning that — ideally — the rest of humanity ought to be as important to you as your mother. This sounds like a utilitarian calculus, but if we are talking about the freedom and lives of many vs the distress of one, then the choice seems clear to me, on virtue ethical grounds. A common misconception is that virtue ethics is not about consequences. Of course it is, but not in the simplistic fashion a utilitarian would use. More broadly, again, the young man has to make a decision between competing demands, all things considered. In this specific case (but not necessarily others) we have the Nazi threat on one side and his mother’s distress on the other. I think a rational decision would weigh the former more than the latter. Responsibility, particularly for those whose existence I am responsible for, comes higher up the indifference scale (I hate ‘indifference’) than an idealistic notion – at any rate for me. Stoicism is about ‘setting ones own house in order’ first. So, whilst I do not disagree with your analysis, it is a situation which I find challenging. You are right, it is a challenging problem. But I find that critique of Socrates entirely missing the point, which is well spelled out by Plato. Socrates explicitly explains that he has to abide by the laws, even if that particular instance of their application is unjust, because he has benefited from them his entire life. Indeed, it is precisely thinking of that example that I wager the Stoics would tend to give precedence to social duties over family ones. Not exclusively, and always depending on circumstances, of course. Indeed, as I said in the OP, this is one of the things that separates us from the Epicureans, who would have no doubt whatsoever about staying with the mother. I don’t think it is fair of accusing Seneca of bad judgment concerning Nero. He arguably tried to manage an impossible situation. I have an essay concerning this coming out tomorrow. As for Marcus, there too the story is more complicated, as argued by Don Robertson in a recent discussion thread at the Facebook Stoic group. I’m with you on Musonius and beards, though! I see there’s already a lively discussion going on here, but I’d like to add a little more food for thought: There was plenty of very important resistance work to be done in France during World War II, so it may not have been as simple and binary as “stay home and do nothing” or “move to North Africa to be an ineffectual desk jockey”. On the other hand, I would consider leaving home a much more viable option if there was someone nearby who I knew and trusted to at least keep an eye on my mother. Some of this would have depended on circumstance, such as where he lived in France, whether he knew the right people, and when specifically this story took place (all we know for sure is that it took place after the German offensive of 1940), but since all we have to go by is a single and rather unwieldy paragraph, I’m going to go ahead and quote Isaac Asimov: Insufficient Data for Meaningful Answer. Oh my, this time you got it all wrong, Massimo. No Confucian or Taoists would ever think or argue this way. It is natural to protect one’s family, while it is rather unnatural to think in abstract terms like ‘nation’. Your stance is as abstract as the extremes of Christendom or Kant or these irrational neo-utilitarians (who seem to hate human nature). Perhaps your left-leaning attitude misled you here. Conservatives would be much more sensible by preferring the near to the far, the known to the unknown, the calculable to the incalculable. The strength of virtue ethics is that it deals with concrete situations, not abstracts – you do not owe allegiance to a ‘battle field’. The examples you bring are meagre and misleading: What Cato’s or Aurelius’ duties might be have nothing whatsoever to do with the duties of a common man to his mother. The strength of a real Stoic is that they are concrete in their actions and attitude, not otherworldly. Your conclusion – “The Stoic would, painfully, leave his mother and fight for a broader cause because it is the virtuous thing to do, regardless of outcome” – completely hangs in the air because it would only be true under very specific circumstances (e.g. it is a soldier’s duty to fight, not a civilian’s!). Well, obviously, I disagree. What a Confucian or Taoist would do is, of course, entirely irrelevant. This is about Stoicism. The Stoics most definitely incorporated a lot of “abstract” concepts into their philosophy, for instance the idea of cosmopolitanism itself. My “left leaning attitude” would arguably be at odds with my conclusion here, since leftists tend to be skeptical of wars. And it is entirely not the case that conservatives would take the “much more sensible” position to stay at home, since many of the conservatives I know (like the last three conservative administrations in the US) are war mongering. You simply declare that my examples of Cato and Marcus are irrelevant, but it isn’t clear why. Marcus very explicitly says that our duty is to improve the human condition, not just our family’s. And of course you entirely ignore my argument that the young man would base his decision on the virtue of justice. The Stoics did not think of social obligations as growing circles, but as contracting ones. The difference is relevant: in the metaphor of growing circles family is first, humanity is last. But if you are attempting to contract the circles you are trying to remind yourself that strangers are just as worthy of attention and protection as your family is. just to note that sartre never hashed out his ethics well – that took simone de beauvoir in ‘ethics of ambiguity’. maximizing freedom for each and every consciousness becomes the north star for choosing one’s projects. she does not say this is easy, as the title suggests.